Financial support: Programs of The National Research Council (CNPq) of The Brazilian Ministry of Science and Technology (MCT): The Millenium Institute of Nanosciences of Brazil; The Brazilian Network of Nanosciences and Nanotechnology; and The South-American Network of Nano-Biotechnology. Coconut is a major crop of many poor nations. The present paper shows with inexpensive fluorescence microscopy of the enhanced green fluorescent protein (EGFP), that coconut water has the capability of synthesizing proteins from recombinant DNA vectors. After only 4 hrs of 100 pM application of the EGFP plasmid (pEGFP), a strong fluorescent signal was detected with an off-the-shelf, low-tech CCD webcam. Since natural coconut water is sterile, this heat-stable delivery system may be a good option for the dissemination of food supplements and pharmaceuticals in poor nations. As expensive substances could be expressed in coconut water, through bioreactor technology or micropropagation, the concepts presented here may prove invaluable to the economic and social advancement of many developing countries. Keywords: bioreactors, coconut, farming, micropropagation, nutriceuticals, recombinant, therapeuticals, transgene, transgenic. Plants are the best choice for the production of recombinant proteins (Ma et al. 2003). Three principal methods are used to produce these proteins, all of which require a DNA sequence to be incorporated into the plant genome: (1) infection with Agrobacterium tumefaciens (Gelvin, 2003), (2) electroporation (Trezise, 2002) and (3) biolistics (Taylor and Fauquet, 2002). To date, no report has appeared on the capacity of coconut water (a syncytial endosperm tissue) to produce recombinant proteins. This paper shows with simple fluorescent EGFP microscopy, that coconut water expresses foreign DNA sequences. Since hundreds of milliliters can be extracted from each coconut, it follows that coconuts can be exploited for large-scale, industrial production of recombinant proteins using bioreactor technology. Furthermore, as coconut water nuclei are naked, devoid of cell membranes, the micropropagation of genetically engineered plant clones is greatly facilitated. From each coconut tree, a single coconut was used if it had a liquid syncytium containing more than 105 nuclei per milliliter. This corresponded to 4-6 months of development. To avoid bacterial contamination, the coconuts were studied within 5-15 m after picking. The coconuts were gently removed with sharp scissors. As higher temperatures accelerated expression, the coconuts were removed from the tree at 12:00-14:00 hrs (i.e. the hottest time of the day). As a consequence, experiments were not carried out during cold and rainy days. Coconut water was extracted under sterile conditions. A single transversal cut was made at the top of the coconut with a sharp, 10 inch-long commando knife. The water was then extracted with a 10 cm-long, 20 gage Teflon needle (Sigma) attached to a 60 ml syringe (B-D Biosciences). Metal was avoided because the colorless, transparent coconut water turned brownish within 5 minutes upon contacting metals. This response of the coconut water to metal contact seems to be caused by the low pH of the coconut water (pH 4.0-5.0  Bustamante, 2002a). That the metal blade of the knife did not produce any reaction was confirmed visually by the stability of the water transparency and lack of coloring. Sterile conditions were maintained with UV light, with HEPA air filtration, with boiling water sterilization, and with anti-bacterial sterilizing liquids. Caution was taken to prevent coconut particles from falling into the water (during and after cutting the top of the coconut) as this brought about browning of the water which was interpreted as a negative reaction of the living syncytial endosperm. The coconut water was studied with a custom-built inverted microscope consisting only of a 100X objective and a 15X eyepiece (Bustamante, 1991; Bustamante, 2002a). The light from a mercury-xenon lamp (Oriel) powered with a stabilized voltage source (Oriel  see Bustamante, 2002a) was used in conjunction with a dichroic filter set for EGFP (Omega Filters). An inexpensive CCD webcam camera (Quickcam Pro P3000 and P4000, Logitech) was used to detect and measure the fluorescent light level. The camera was attached to the eyepiece. The experiments were carried out in a 100 µl chamber with a bottom made out of a microscope coverslip. Additional information on the experimental system has been published (Bustamante, 2001; Bustamante, 2002a; Bustamante, 2002b). Experiments were carried out at room temperature (24-26ºC). The plasmid pEGFP-C1 (Living Colors Family of Vectors, B-D Biosciences-Clontech) having a mass of ~3.1 MDa, was selected for the testing of the capability of coconut water to synthesize recombinant proteins. The plasmid stock solution was prepared in the plasmid original commercial storage vial by adding fresh coconut water filtered through a 0.22 µm syringe filter (199-2020, Nalgene). Unused portions of the stock solution were transfered with DNAse- and RNAse-free pipette tips (Biopur, Eppendorf) into DNAse- and RNAse-free microcentrifuge tubes (Biopur, Eppendorf) and stored at -80ºC. A small volume (1-5 µl) of the plasmid stock solution was directly applied to the experimental chamber containing freshly extracted coconut water (i.e. liquid syncytial endosperm). The pipette used for application of the plasmid was also used to gently stir and thus dissolve the added plasmid into the final 100 µl of working coconut water. The final concentration of the plasmid varied between 1 and 100 pM. Only results for 100 pM are shown. Imaging with the inverted microscope was carried out through the coverslip that formed the bottom of the experimental chamber. The fluorescence level was calibrated following standard procedures (i.e. Liu et al. 2001; Ehrhardt, 2003). Twenty four coconuts of 93±12 mm diameter, 111±18 mm length and 149±37 ml (mean±SD) were used. Figure 1a and Figure 1b illustrates typical syncytial nuclei (large-size video files showing mechanical movement of the nuclei are available on request). The cell-free/naked nuclei had internal and external movements. Syncytial endosperm contains cell-free, naked nuclei that continuously divide because one of the functions of the nuclei is to form new layers of endosperm cells (Cutter and Freeman, 1952). Fourteen divisions were observed in all the coconuts studied. These divisions took about 1 hr to complete. The slow division could be characteristic of the 12 months that take for coconuts to reach maturity. Another possibility is that the slow division may result from changes in the chemical and/or physical conditions. The observed density and the mechanical activities directly correlated with the level of expression of EGFP. This observation may be a good assay for in loco coconut selection. Figure 1c shows a fluorescence microscopy image taken after 4 hrs of pEGFP-C1 application to the experimental chamber. Unmolested, virgin trees were the best trees for EGFP expression (r.u. 98±6%, n=8). Trees disturbed weekly (one coconut picking per week) had only slightly lower expression levels (r.u.=89±9%, n=16). Trees that were allowed daily disturbances reduced their nuclear density and nuclear movements within one month, suggesting a programmed hibernating defense mechanism. The entry of pEGFP-C1 into the naked nucleus, exclusively via the nuclear pores, is assisted by the nuclear localization signals present in the transcription factors attached to the plasmid (Bustamante, 2002a). For bioreactor technology this may not be relevant. However, this greatly facilitates plant genetic engineering and clonal micropropagation. The large volume of water in each coconut translates into significant savings because no culture broth is needed (as is the case for microbial fermentation systems). In regard to micropropagation, one could question the fact that the endosperm is triploid tissue. However, this this should raise no concern because it has been demonstrated that hexa- and dodecaploid plants produced from endosperm (Cantoni et al. 1993; Tao et al. 1997; Chaturvedi et al. 2003). The demonstration that an inexpensive webcam CCD camera (about US$100) can be used to measure protein expression in coconut seems significant to the dissemination and implementation of the concepts presented here. The success of the low-tech approach for the detection of EGFP synthesis by coconut water demonstrates that the level of expression is indeed high. The success of this simple approach results from at least three facts. First and foremost, as shown here, coconut water is an excellent system for recombinant protein expression. Second, the simplified design of the custom built microscope (see Materials and Methods) minimizes the optical path and, therefore, optimizes the light-gathering capacity of the detection system. Third, the stability of EGFP results in the continuous integration of the signal over time. The use of coconut for the production of expensive substances (either through bioreactor or genetic engineering for clonal micropropagation) should be of interest to poor nations. Coconuts should prove an excellent refrigeration- and needle-free system for the delivery of nutriceuticals and therapeuticals to the peoples of all nations and, specially, to the peoples of poor developing countries. The author would like to thank Prof. Dr. Hans Oberleithner of the University of Münster, for securing the authors visit to the Institute of Physiology during June-July of 2003. This visit allowed confirmation of the present observations with expensive sophisticated, high-sensitivity and high-resolution fluorescence microscopes and with laser-scanning confocal fluorescence microscopy. Thanks are also tendered to Dr. Jefferson Luis da Silva Costa, of Embrapa-Tabuleiros Costeiros, for encouraging me to disseminate my observations. Bustamante, J.O. An inexpensive inverted microscope for patch-clamp and other electrophysiological studies at the cellular level. Pflügers Archiv European Journal of Physiology, July 1991, vol. 418, no. 6, p. 608-610. Bustamante, J.O. Nuclear transport methods. In: TZVIRA, T. and CITOVSKY V.H. eds. Nuclear Import and Export In Plants and Animals. Austin, Landes Bioscience, 2001, p. 20-39. ISBN 1-58706-122-8. Available from internet: http://www.Eurekah.com. Bustamante, J.O. Nuclear pore ion channel activity in living nuclei. Pflügers Archiv European Journal of Physiology, May 2002a, vol. 444, no. 1-2, p. 286-290. Bustamante, J.O. Recent advances in nuclear electrophysiology. In: DE FELICE, L.J. ed. Biophysics Textbook On-Line. Biophysical Society of the USA, Bethesda, Maryland, 2002b. Available from internet: http://www.biophysics.org/btol. 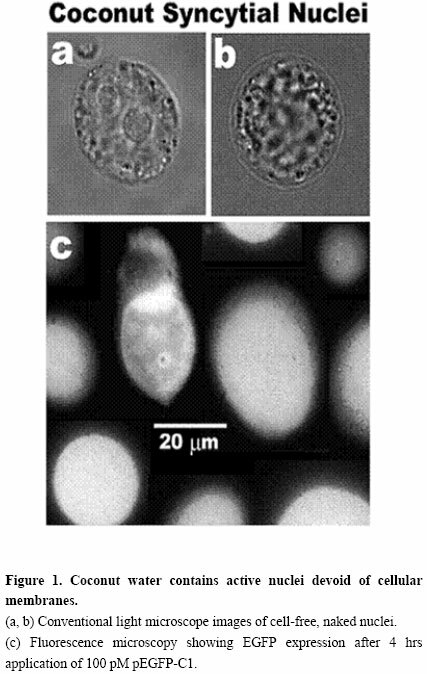 Cantoni, L.; Berardi, G. and Rosati, P. Callus induction from endosperm culture of blackberry. Acta Horticulturae (ISHS), October 1993, vol. 352, no. 20, p. 145-150. Chaturvedi, R.; Razdan, M.K. and Bhojwani, S.S. An efficient protocol for the production of triploid plants from endosperm callus of neem, Azadirachta indica A. Juss. Journal of Plant Physiology, May 2003, vol. 160, no. 5, p. 557-564. Cutter, V.M. Jr. and Freeman, B. Development of the syncytial endosperm of Cocos nucifera. Nature, November 1952, vol. 173, no. 5382, p. 827-828. Ehrhardt, D. GFP technology for live cell imaging. Current Opinion in Plant Biology, December 2003, vol. 6, no. 6, p. 622-628. Gelvin, S.B. Agrobacterium-mediated plant transformation: the biology behind the "gene-jockeying" tool. Microbiology and Molecular Biology Reviews, March 2003, vol. 67, no. 1, p. 16-37. Liu, S.; Bugos, R.; Dharmasiri, N. and Su, W.W. Green fluorescent protein as a secretory reporter and a tool for process optimization in transgenic plant cell cultures. 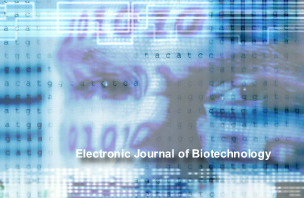 Journal of Biotechnology, April 2001, vol. 87, no. 1, p. 1-16. Ma, J.K.; Drake, P.M. and Christou, P. The production of recombinant pharmaceutical proteins in plants. Nature Reviews Genetics, October 2003, vol. 4, no. 10, p. 794-805. Tao, R.; Ozawa, K.;Tamura, M. and Sugiura, A. Dodecaploid plant regeneration from endosperm culture of persimmon (Diospyros Kaki L). Acta Horticulturae (ISHS), January 1997, vol. 436, no. 12, p. 119-128. Taylor, N.J. and Fauquet, C.M. Microparticle bombardment as a tool in plant science and agricultural biotechnology. DNA Cell Biology, December 2002, vol. 21, no. 12, p. 963-977. Trezise, A.E. In vivo DNA electrotransfer. DNA Cell Biology, December 2002, vol. 21, no. 12, p. 869-877.